Federal School Safety Commission Holds First Public Session. DeVos Wasn't There The Federal Commission on School Safety held its first public listening session Wednesday. Secretary DeVos, the chair, as well as the three other cabinet secretaries on the commission, did not attend. Education Secretary Betsy DeVos Chairs the Trump Administration's School Safety Commission. She is seen here during a House Education and the Workforce Committee meeting last month. The Trump administration's school safety commission held its first public listening session Wednesday, a day after the panel's chair, Education Secretary Betsy DeVos, told lawmakers on Capitol Hill that the commission wouldn't focus on guns. Alessia Modjarrad, a graduating high school senior from Montgomery County, Md., spoke at the day-long event at the Education Department in D.C. She said the few solutions being offered by the administration were "misguided and insufficient." "I would ask to please consider the possibilities that guns are the most important aspect of the purview of this commission," Modjarrad said. Then she issued a challenge. "I would ask Secretary DeVos and the federal commission to take on the burden of positive, ever-lasting change from school children and heavily reconsider the current complicit stance on the role of guns in school safety." That challenge will have to be relayed to DeVos at a later time. DeVos didn't attend the listening session. She was in Switzerland where she's set to deliver a keynote address at forum exploring apprenticeship programs and primary and vocational school education in the Netherlands, according to a press release by the Education Department. On Tuesday, DeVos was asked by Sen. Patrick Leahy, D-Vt., during a Senate subcommittee hearing: "So, you are studying gun violence, but not considering the role of guns?" 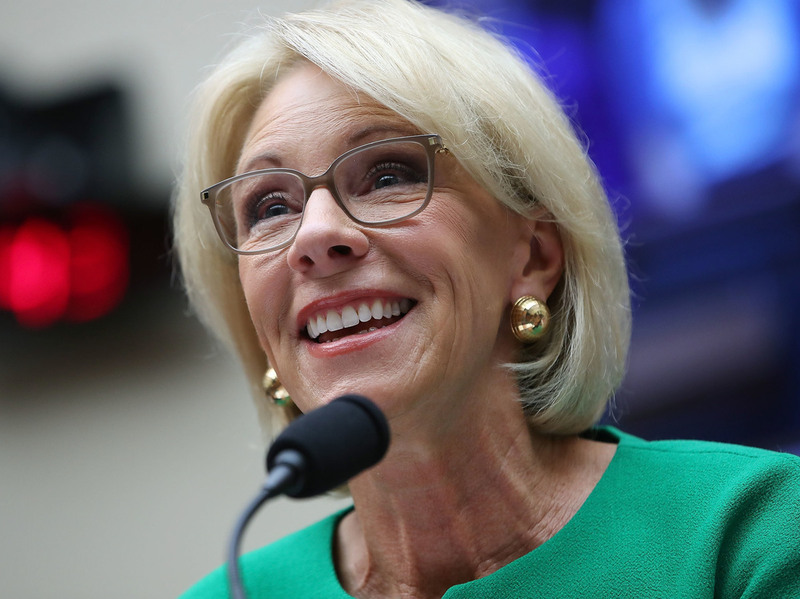 DeVos responded: "That is not part of the commission's charge, per se." President Trump established the school safety commission in response to the mass shooting in February at Marjory Stoneman Douglas High School in Parkland, Florida, where 17 students and faculty were killed. When established in March, one of the stated goals in the White House release was a focus on "age restrictions for certain firearms purchases." During Wednesday's listening session, Deputy Education Secretary Mick Zais tried to clarify how the commission would handle guns. After citing a Congressional Research Service report that found there are approximately 300 million firearms in the U.S., he said the commission would be exploring "narrow aspects of gun ownership." "The commission will not be looking at ways to confiscate those weapons or abrogate the second amendment, but what we will be doing is looking at specific age limits for the purchase of specific kinds of weapons," Zais said. "And we will be examining legal procedures for the confiscation of weapons from people with identified mental health issues." Students have been a prominent voice in the gun discussion following the high profile shootings in Parkland and in Santa Fe, Texas last month. And this was the first time the public had an opportunity to offer suggestions to the commission on how to make schools safer. Michael Yin, another Montgomery Country student said that school shootings are "not unthinkable, they're expected." "We students feel and we know that something is very, very wrong in our schools," Yin said. He urged the panel to listen to the voices in the school, not those calling for more guns in school. "Politicians have come up with some good ideas, but if we really want to end these tragedies, we need to listen to the people closest to the school system. One idea that is a little worrying though is arming school staff," Yin said. Amanda Fitzgerald the Director of Public Policy at the American School Counselor Association agrees. "We strongly oppose any effort to arm educators in our schools or any proposal that would offer financial incentives for educators to carry firearms," Fitzgerald said. Pamela Champion, who lost her son, Robert Champion, a drum major at Florida A&M University, to hazing incident on a band bus said she is "all too aware about the safety and the impact of violence within our schools." She said the commission should not only focus on the role of guns but the environment within schools, too. "We should expand and clarify what is deemed as school safety. What does school safety look like for various communities?" Champion asked. She said that school safety should not be measured just by the absence of violence but how well schools can build emotional and social tolerance. The commission has held a number of closed-door sessions in recent weeks, including one with survivors of the Parkland and the Columbine High School shooting in 1999. And Last week it held a field hearing in Hanover, Maryland. The Federal Commission on School Safety is expected to issue its recommendations by the end of the year.